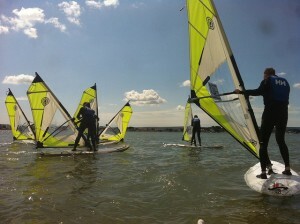 What a summer season it has been here at the Poole Windsurfing School! Thanks to all of you that have taken the time to write or call with glowing testimonials, your words of praise are much appreciated by all of us! It is great to know that our tuition & all the latest equipment we use is appreciated and that you are all loving your time windsurfing with us here at the Poole Windsurfing School. Checking the forecast (to the left) the last couple of weeks of the season will be sunny and windy, perfect for getting in a last few sessions before winter sets in! 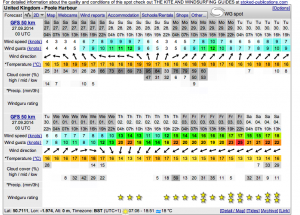 Whether you are looking to learn how to windsurf, progress with some improver skills or just hire some windsurf equipment to develop what you already know, conditions look really nice. Remember, if you have been windsurfing with us this summer, we have photos from all the on water action up on the website. Just checkout our windsurf Photo Gallery page to see yourself or others having fun at the Poole Windsurfing School. To the left you can see just how nice the windsurfing at Sandbanks, Poole has been this summer. The days like these, with a nice steady breeze and a ton of sunshine have been pretty much back to back since May! If you want to get the most out of the last couple of weeks of our season (and the summer) then get in touch and we can get you out there enjoying some windsurfing before winter sets in! Hope to see you all back at the Poole Windsurfing School for at least one final blast this season.